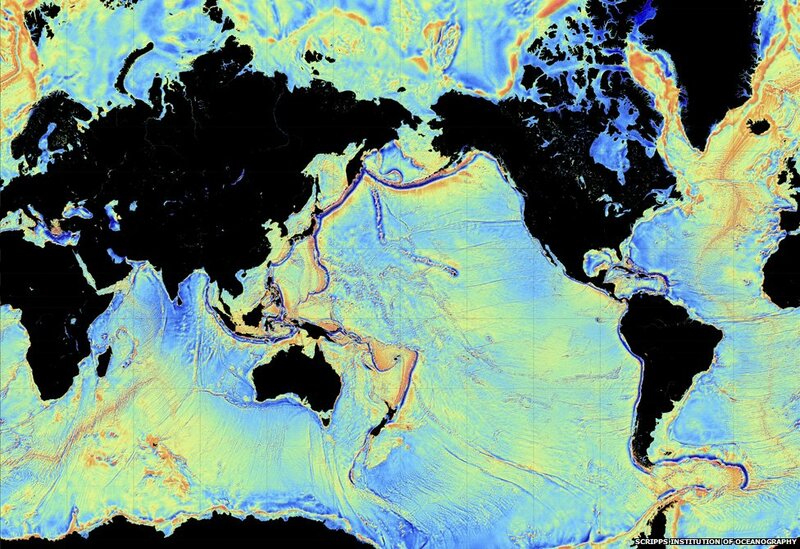 The data has caught the attention of Google, which plans to use this data for its upcoming ocean maps release. Scientists also say the information will tell us more about the 80% of the ocean floor that is either unexamined or obscured by thick sand. So here’s where the data came from. The Scripps Institution of Oceanography combined information from two satellites — the European Space Agency’s ongoing CryoSat mission and the now defunct Jason-1 satellite from NASA and the French space agency CNES, which was decommissioned in 2013 after nearly 12 years of operations. CryoSat is designed to map the thickness of ice using a radar altimeter (which is a clue to the effects of climate change). But this altimeter can be used all over the world, including to look at how high the sea floor is. Jason-1, for its part, was told to look at the Earth’s gravity field in the last year of its mission. And what a world pops out when this data is used. Some of the new findings include finding new bridges between Africa and South America and uncovering seafloor spreading that happened in the Gulf of Mexico 150 million years ago. Results based on the study, led by Scripps’ David Sandwell, recently appeared in the journal Science. Long-time readers of Universe Today may also recall a gravity map from ESA’s Gravity Field and Steady-State Ocean Circulation Explorer (GOCE), which revealed Earth’s gravity as a lumpy potato shape in 2011. The ESA has scheduled the launch of Cryosat-2 for February 25th aboard a Russian Dnepr rocket from the Baikonur Cosmodrome in Kazakhstan. This is the second attempt at launching the Earth-observing satellite that’s tasked with monitoring global ice thickness. The initial launch of Cryosat on October 8th, 2005 failed due to an anomaly of the launch sequence. Other Earth-observing satellites have taken measurements of the ice thickness near the poles, but Cryosat-2 will be the first such satellite completely dedicated to monitoring ice thickness variations, and will keep tabs on the decline of sea ice, which in the Arctic has been shown to have shrunk 2.7% per decade since 1978. The first Cryosat mission was initially destined to become the first of the ESA’s Earth Explorer satellites. The other two – Gravity field and steady-state Ocean Circulation Explorer (GOCE) and Soil Moisture and Ocean Salinity (SMOS) – are currently in orbit. Cryosat-2 will have a highly inclined polar orbit, and will reach 88 degrees north and south, so as to maximize the amount of observations of the Earth’s poles. The instruments aboard the satellite will be able to monitor the thickness changes in both sea ice and land ice with an accuracy of one centimeter. This will give scientists an unprecedented amount of data to work with to study how Arctic and Antarctic ice changes impact climate change, and vice versa. The instrument aboard Cryosat-2 that will be measuring ice thickness is the SAR/Interferometric Radar Altimeter (SIRAL). This is a an altimeter and interferometer that operates in the Ku-band (13.575 GHz), and uses radar signals bounced off the ice to measure its thickness variations. Cryosat-2 also has two other instruments to determine its position with a high amount of accuracy, the Doppler Orbit and Radio Positioning Integration by Satellite (DORIS) and Laser Retro-Reflector (LRR). DORIS detects and measures the Doppler shift of signals broadcast from a network of radio beacons spread around the world to give the velocity of the satellite relative to the Earth. The LRR instrument will complement and help calibrate DORIS. The LRR is a small laser retroreflector that is attached to the underside of the satellite, and lasers from a network of tracking stations will be fired at the satellite. By measuring the interval between the firing of the laser and the return of the pulse, the position of the satellite can be measured very accurately. The mission has a three-year lifespan, with a potential for a two-year extension. Cryosat-2 is currently nestled safely inside the Dnepr rocket’s protective fairing, and in the next nine days the satellite will be integrated into the rest of the launcher and moved out to the launch pad.